Visited this amazing art center, owned by the Prada Foundation in Milan. An old distillery transformed in a huge exposition area, with all the industrial buildings superbly refurbished by Archistar Rem Koolhaas. You would enter this room after walking a winding corridor completely in the dark. The effect was exhilarating. Almost lysergic! A real attack on the senses - even in 2d without the winding dark corridor! For the brave/foolhardy souls who are prepared to eat these fly agaric mushrooms - after a long boiling to drive off the toxins - the effect is indeed lysergic. Must be a breath taking moment to be these enormous fungi. 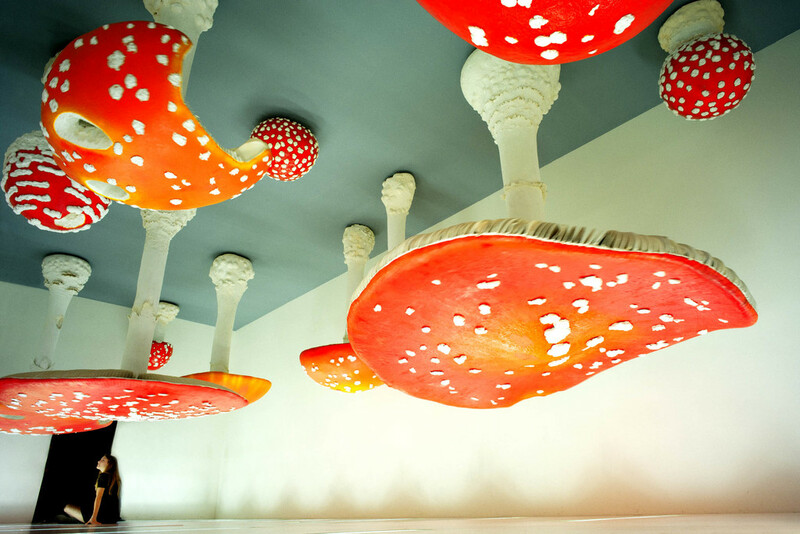 Blimey, magic mushrooms on the ceiling. This must be a fabulous place with so many interesting exhibits to see. @helenhall Thank you, Helen! In 3d, to increase the odd effect, the mushrooms rotate! @caterina Thanks a lot, Caterina! @golftragic Indeed it is! One of the coolest places I ever visited! Intriguing image, I had to google the building as Rem Koolhaas is a fellow Dutchman but I didn't know about this building. @domenicododaro So good you can share it with us, many thanks. Must have been difficult not to take a bite out of them in your altered state! @leonbuys83 Thanks, RK did care about refurbishment, little structure changes from the original industrial complex. @yrhenwr hahaha maybe one young lady hitting one of them with her forehead after a long selfie session helped me recover some clarity!